Alison, our Managing Director, reflects on the ban on junk food advertising by TfL and how it could impact the nation. The ban on advertising junk foods and soft drinks across TfL has been criticised by some as a ‘blunt tool’ that will significantly reduce TfL revenues at a cost to transport infrastructure. But many academic studies have shown that banning junk food advertising, as well as tobacco and alcohol advertising, results in reduced consumption, so why are we so quick to criticise? Sometimes I think people just criticise for the sake of having something to say! The reality is that junk food advertising ban is just a very small part of a much the bigger picture, or as the government terms it a ‘whole system approach’, in which individuals and organisations are working tirelessly to address the UK’s obesity crisis, particularly in children. So, before criticising individual initiatives that attempt to contribute to the ‘whole system approach’, consider the context of decades of relentless efforts to change behaviour by academics, health organisations, government and industry. Obesity isn’t just a problem in itself, it results in so many other conditions, from minor to life threatening, in the person who is overweight themselves and also in any children they may have, not just through copied behaviours but through their very DNA. The NHS in England spent £6.1 billion on overweight and obesity related ill-health in 2017-18. According to the NHS, in 2016-17, 617,000 admissions to NHS hospitals were related to obesity, as increase of 18 percent on the previous year. NHS data shows that nearly a third (28 percent) of children in England aged 2 – 15 years are overweight or obese and the issue is greater in older children with 36 percent of 11 – 15-year olds being overweight or obese.In its report on TV advertising of food and drink products to children, Ofcom lists just some of the initiatives that have been introduced in recent years to help address the issue: Healthy Start, Sure Start, Children’s Play, Healthy Schools, Physical Education and School Sport, School Travel, Social Marketing, Obesity Care, in addition to arguably the most high profile family targeted campaign, Change4Life. Literally millions and millions of £s have been ploughed into efforts to change consumer eating behaviours, reduce the amount of HFSS foods consumed, and increase levels of physical activity. The fact that obesity levels have continued to rise, despite all of the money and resource invested in turning the tide, suggests that a heavier-handed approach is required that will force change in the behaviours of all involved, from food manufacturers to retailers and consumers. It is too easy and lazy to blame the likes of McDonalds, with its cheap, fat, salt and sugar-laden foods, for making us fatter. It is also too easy and lazy for the likes of McDonalds to claim it has balanced the scales by offering and promoting ‘healthier options’. 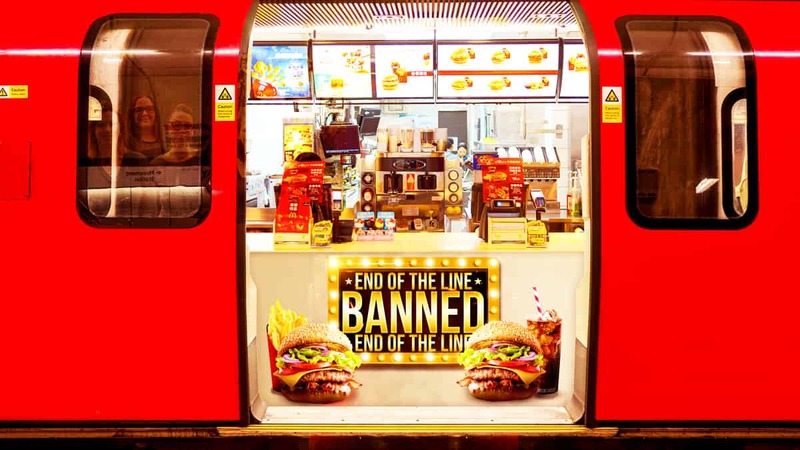 Personally, I applaud TfL’s move to ban advertising – as well as making a strong statement about the organisation and its appetite for taking responsibility, it is a proven and effective way of reducing HFSS food consumption, and we have precious few of those! Also, I applaud the work of organisations like the British Nutrition Foundation. The team there is working to reduce obesity in whichever way they can; through their recent portion sizes initiative, their Task Force report on cardiovascular disease, and their annual Healthy Eating Week for schools. So, we now know for sure that there is not one overall approach that will impact obesity levels for the better. It will take the efforts of every person and organisation in any position with power to influence both the food chain and consumer purchasing and consumption behaviours. The fact is that in general we eat too much, we eat too much of the wrong things, and we are too sedentary. We all need to stop making excuses and take responsibility for our own behaviours.